So, if Gokata is supposed to be a faster, more proactive version of Ichikata, Nikata, and Yonkata, one of the first questions that folks ask me is, "Why have another kata if it is just supposed to be faster? Why not just do Ichi, Ni, and Yon until we get good enough to be proactive and direct with an efficient uke?" I agree, that is something like our end goal in aikido. We would like to get so good, to have the principles ingrained so well, that every motion and every encounter is an ideal expression of all principles. Ideally we would be proactive and direct and uke would be ultra-efficient all the time. Ichikata introduces some minor technical variations, but really seems to explore large motion and perpendicular vectors as a major theme. Nikata minors in technical variation but majors in small-motion in confined spaces using powerful hip switches and oblique angulation. Sankata introduces variation in ma-ai as a major theme - working from suwari to tachiwaza to longer weapons ranges. Yonkata is back to the large motion ideas, but it has a distinct flowing, light, airy feel to it. Gokata is a proactive, high-energy thing - or if you want to call it "faster and more aggressive" ok.
Rokukata seems to be a sort of an opus - an artistic synthesis of all of these ideas. Maybe it is Ohba's masterpiece, whereas Sankata was Tomiki's masterpiece - I'm not sure. Pretty much all of the technical variation that you see in the Koryu no kata is spread out here and there primarily in the first two or three kata. After that, you don't see new techniques. What you see is new ideas or new energies - new spirits. New ways to play with the technical things that you already know. So, instead of having a whole new set of technical things for you to concentrate on in Gokata, they mostly re-used chunks of Ichi, Ni, and Yon and suggested that you practice them in a different mode. 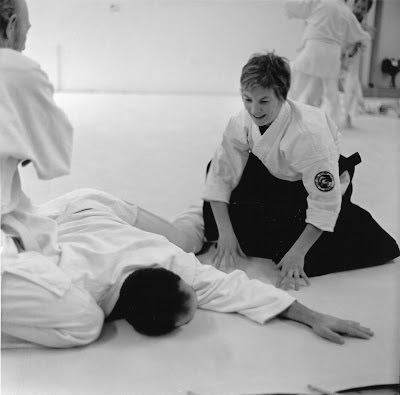 They are suggesting that you pay attention to the mode or the spirit of your aikido rather than the techniques. Making you re-do your old material in a different spirit - that is transformative.